The 5th edition of Zagreb Guitar Festival will take place from March 31 to April 6, 2019 in Zagreb, Croatia, and it is going to present a full programme of masterclasses, lectures, international guitar competition, concerts and EuroStrings activities. As part of Zagreb Guitar Festival, EuroStrings conference will be held from April 4 to April 6. World-renowned lecturers from all over the world, lectures devoted to the guitar world and cultural entrepreneurship, professional training of guitar teachers in collaboration with the County Council, tips and examples of good practice on collecting funds for cultural events and audience development and many other interesting topics will be discussed during the 3-day conference program. During the festival EuroStrings Orchestra consisting of EuroStrings Artists and directed by Thomas Offermann will be performing together with EuroStrings Ambassador Aniello Desiderio as part of All Stars EuroStrings Night. 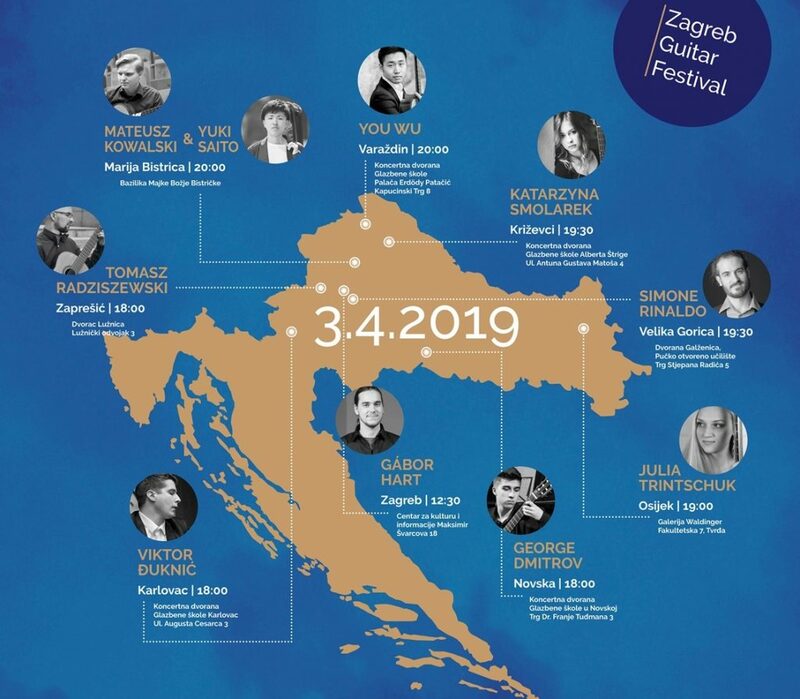 EuroStrings Artists will also participate in Zagreb Guitar Festival concert cycle “Guitar in Croatia” organized by Zagreb Guitar Festival in cooperation with Croatian cultural institutions, which will take place all over Croatia. EuroStrings Artists that will participate in Zagreb Guitar Festival are Katarzyna Smolarek, Mateusz Kowalski, Tomasz Radziszewski, Julia Trintschuk, Viktor Đuknić, Gábor Hart, Simone Rinaldo, Yuki Saito, George Dimitrov and You Wu. Stay tuned and follow the #ZGF2019 activities on Zagreb Guitar Festival Facebook Page. ← EuroStrings Composition contest appears on the front page of Classical Guitar Magazine website!